Arex never attended Starfleet Academy, but was a member of the merchant space fleet. He earned a field commission after a ship he was on was nearly captured by Klingons and the officers aboard were all killed. Eventually Arex spent two years teaching space navigation at Starfleet Academy, where he served as an instructor to Pavel Chekov. While under the influence of Harry Mudd's love potion, Arex sat at the navigator's station playing a lute, instead of attending to his duties. Upon the Enterprise's encounter with spiroid epsilon waves, he was momentarily blinded, but suffered no permanent vision damage. Later, he reported that he could no longer perform visual sweeps, as his eyes were too small for the opticals. He was given the conn following Lieutenant Nyota Uhura's disappearance of the Shore Leave Planet. When Commander Spock was incapacitated by choriocytosis, Arex assumed his duties at the Enterprise's science station in 2270. While the rest of the command crew was having a staff lunch, Arex was temporarily in command of the Enterprise. He later took his lunch break with M'Ress, asking Mister Scott if he wanted to join them. Shortly after, Scott blamed them for the malfunctioning food dispensers and threatened to report them to the captain, but Arex maintained their innocence. When the Enterprise entered a negative universe in 2270, Arex began to grow younger, eventually becoming a child. His condition was reversed by Doctor McCoy using the ship's transporter. In 2293, Arex attended James T. Kirk's memorial service in the grounds of Starfleet Academy, along with many other former Enterprise crewmembers. In 2305, Arex was aboard a shuttlecraft that fell through a wormhole, throwing him 71 years into the future, to 2376. 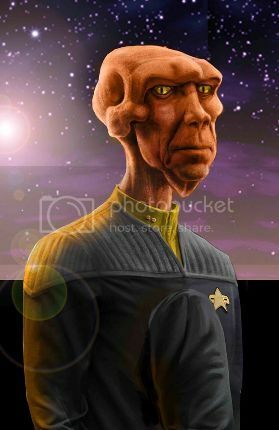 After spending a brief time with the Federation Department of Temporal Investigations' Temporal Displacement Division, and a trip back to Triex to witness the death and rebirth of his father, Arex was reassigned to the USS Trident, under the command of Captain Elizabeth Shelby, as security officer.